Looking for the the best fun kids places in Singapore to visit? Where are the best fun kids places in Singapore for a walk-about or to spend some quality family-child bonding time? We have looked at some of the best fun kids places in Singapore and have narrowed them down to the following. Note that these best fun kids places in Singapore are chosen based on our individual tastes and may not be a reflection of what your unique set of needs and wants. Be amazed by the massive collection of artifacts and historical relics in the largest museum that you can find in Singapore. Look out for special activities and programmes for kids that are organized there from time to time. Spend time window shopping around this massive complex of uber-cool shops and escalators. While we won't encourage very young kids to climb the rock wall there, we will certainly highlight the escalators that your kids could climb. Just make sure your children stay away in the middle of the escalators to prevent toe injury. Let your children enjoy themselves at the open air public playground that comes with water features. 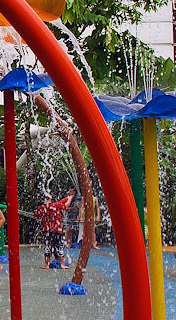 Wander around the sprays and water fountains in this water-themed playground like no other. Let your kids play sand in the secluded beaches around the jetty. As day slips leisurely into dusk, watch a beautiful sunset along a wooded coast that is far away from the hustle and bustle of the city. They come in all shapes and sizes, those child-friendly contraptions built at the foot of tall HDB flats where kids of all ages congregate at these children's playground like bees to honey. These playgrounds are un-gated, free of entry fees and let your children mingle with kids of all races. Do you have your own list of the best fun kids places in Singapore to share? Write to us and we will be more than happy to feature your choices that you consider to be the best fun kids places in Singapore. So bring your family to the best fun kids places in Singapore today!